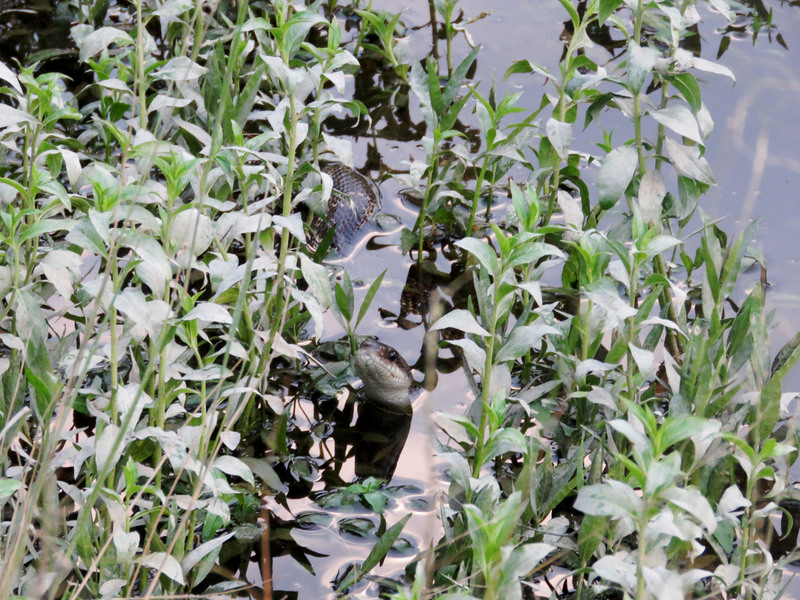 Just a few days after I saw the Corn Snake, I saw a snake swimming across our pond. 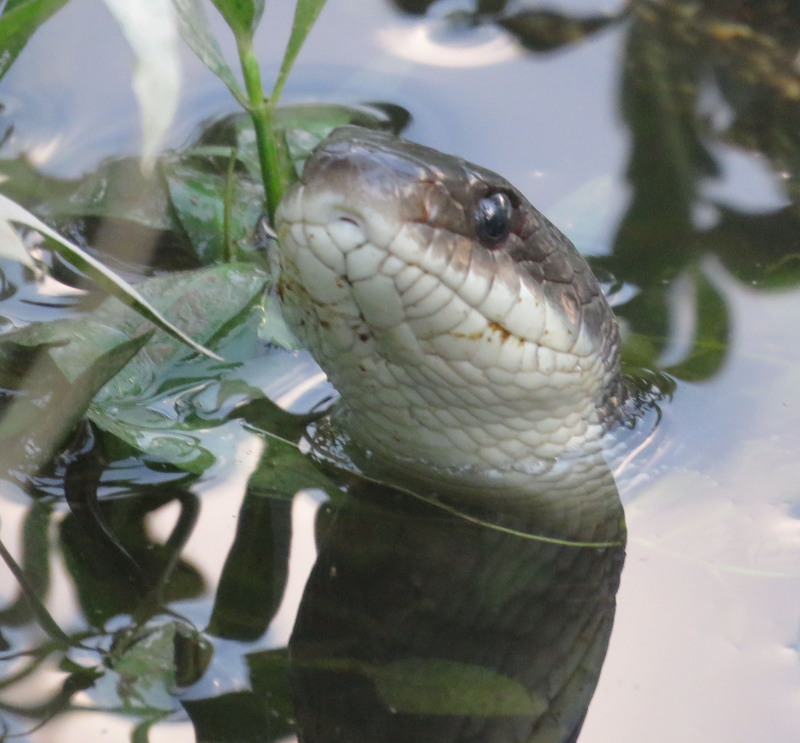 One thing I’ve noticed is that some snakes swim with just their heads out of the water, but some seem to swim up on top of the water, with the top half of their body visible. Being that I had just spotted the Corn Snake, I thought it was probably that same snake, but I wanted to see if I could get pictures of it swimming. So I ran around to the spot on the shoreline that I thought the snake would end up. When I got there, I heard some splashing to my right, and I was thinking, “Huh, I overshot where it went. I wonder if I can sneak up on it.” But as I was standing still, plotting my path through the briers, I felt some eyes on me. One of these things is not a water plant. I had indeed picked the right place on the bank, and the snake was right there with me. It was not the Corn Snake, but I wasn’t sure what it was. Now that I have been identifying snakes from photos for a while, I know that it is helpful to get pictures from as many angles as possible. 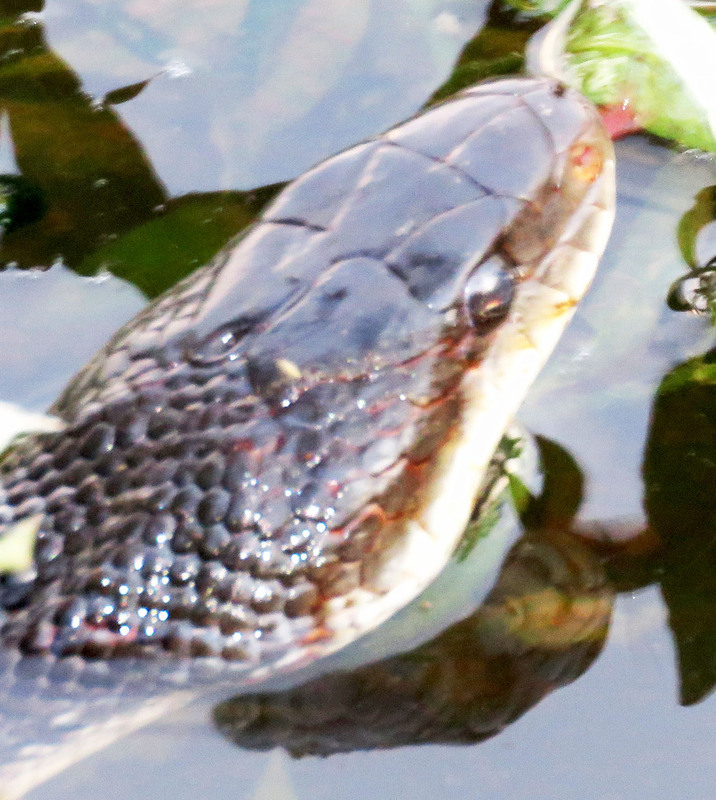 To do the snake ID, you might need to know how the pattern of scales under its chin, or on the top of its head. The scale shape and color on top of the head can be a helpful hint for ID. 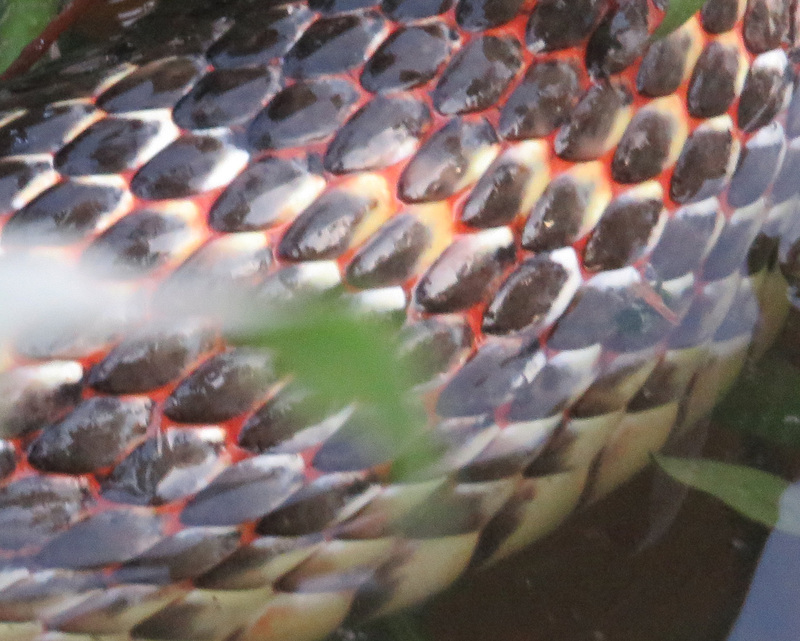 You may need to count the rows of scales on its body, or look at the skin pattern that shows between the scales, or count how many light scales appear between dark patches. Any pattern on the skin beneath the scales can be a clue. 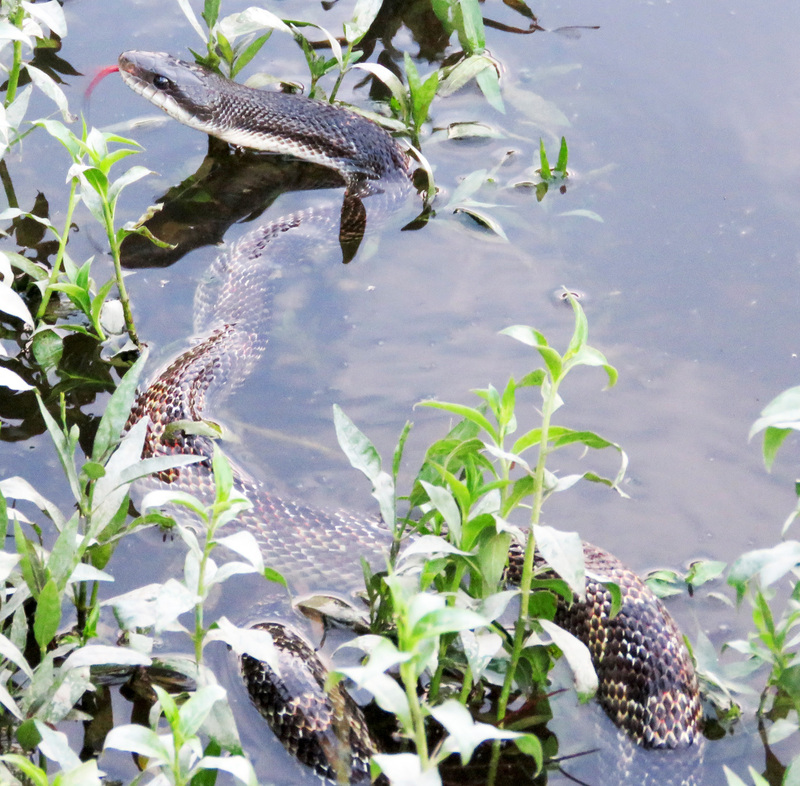 The pale banding between the large dark blotches wasn’t apparent until the snake stretched out to swim. So from all these picture, I was able to tell it was a Texas Rat Snake. I have seen a few of them around before, but those were much larger than this one, which was about 3 feet (1 meter) long. Rat Snakes are great climbers. Every now and then I hear all the birds raising a ruckus in one tree, and I will look up there and see a Rat Snake at the level of a two-story house. An endangered bird in our area, the Red-cockaded Woodpecker, is the only woodpecker to carve its nest holes in living pine trees (most woodpeckers use dead trees). The sticky sap continually drips down around the holes, and this is thought to be a snake deterrent. With all the genetic study lately, some genus names are changing, but for now, this snake is still known as Elaphe obsoletus lindheimeri.